There’s No Place Like S.L.A.M. Wednesday is Track Attack and Yoga Day. Locations vary for Yoga. Please check the facebook page for meetup locations on this day. (This description is for Spring, Summer and Fall– Winter will be at the Riverfront Community Center).We will move to different locations throughout Fort Leavenworth during class, but we will start at the Post Theater parking lot and end at the EFMP playground behind the Post Theater. Please check the facebook page before coming in case of location change. We will have class inside the Leavenworth Riverfront Community Center for inclement weather (November to March) at 123 S Esplande St. Leavenworth Kansas. Please check our facebook page before attending to see if there are location changes. Keep Up With SLAM'n Leavenworth! Join SLAM Leavenworth on Instagram! Contact the SLAM Leavenworth Team! Meghan Argo is a certified NETA Group Fitness Instructor and a YogaFit yoga Instructor and certified in CPR/AED. Meghan is from Georgia and has been an instructor with SLAM Savannah as well as SLAMBoss to Leavenworth. Meghan lives on Fort Leavenworth with her husband Reamer and 3 sons; Reamer (9), Tucker (7), and Ryder (4). 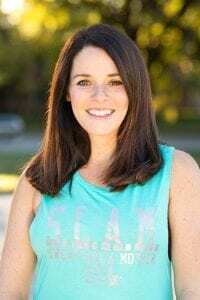 Meghan is passionate about yoga and has developed a successful children’s yoga program. Meghan’s favorite way to SLAM is by running, and of course her yoga practice. 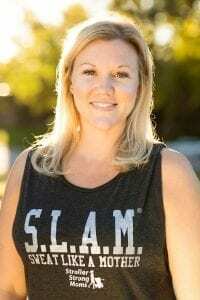 Erin is an ACE certified group fitness instructor, a CrossFit Level 1 Trainer and is CPR/First Aid certified. She has been a part of SLAM since 2013, started instructing with SLAM Columbus in 2016 and moved to SLAM Leavenworth in 2018. Erin is a mom to one little girl and one little boy who have luckily always loved riding in their BOB. Gymnastics created Erin’s fitness foundation and her favorite ways to sweat are doing handstands, burpees, lifting some heavier weights and running! 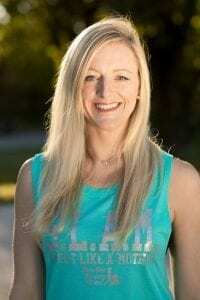 Amy is a 200hr registered yoga teacher and has been teaching for three years. All three of those years she has taught Stroller Strong Moms at Columbus Ga. and at Leavenworth. Her classes are geared toward all levels and promotes self love, body awareness, and learning to find peace in the now. Amy grew up in a military family and has lived in many different places her whole life. Amy is married to Michael Muskus an Army Officer and they are blessed with their seven year old, Grace. Sarah is an ACE certified group fitness instructor and is CPR/First Aid certified. She was also an RN in the Army for five years. During her time in the Army, Sarah discovered how much she loves the motivation and accountability that group fitness offers. Stroller Strong Moms offers that same friendly and challenging camaraderie she craved in the military. She loves that this community gives her three young daughters a front row seat to watch women encourage and challenge each other every day! Meghan is a WONDERFUL teacher that drives you to go beyond your comfort zone. The best feeling in the world is watching your body do things it couldn’t do the week before and this is the gift she gives to each of us every class. My time here in Fort Leavenworth would not have been nearly as wonderful without this group! This class and all of the wonderful women I have met through it will be the thing I take away from here and miss most.